In May 2002, after 450 years of near-continuous foreign occupation, East Timor became an independent state. The road to independence was long and traumatic. Even so there's plenty to admire in this picturesque country of beaches and mountains while getting to grips with the complex history. The Portuguese first arrived on the island in the early 16th century and by the 1550s had occupied the eastern part. The Dutch took control of the western part, which became part of the Dutch East Indies and, after independence, Indonesia. In 1975, the new left-wing Portuguese government relinquished all of its colonies. East Timor then enjoyed just a few days of independence, before the Indonesians annexed it as their 27th province. There was little local resistance and the international community largely acquiesced. In the aftermath, the main independence movement faced a savage counter-insurgency, during which the Indonesian army killed over 100,000 East Timorese. Finally, a referendum was offered to East Timor in 1999, and 80% opted for independence. Violent reprisals by the military followed, but the country eventually became independent. Colonial architecture, Portuguese fortresses and other treasures from the 100-year Portuguese occupation can be found all over the country. However, many towns and villages were destroyed during the Indonesian occupation and the fighting in 1999, and these are only slowly being rebuilt. Many houses are still erected on stilts in the traditional way, using local materials such as grass, bamboo, tree trunks and palm leaves. 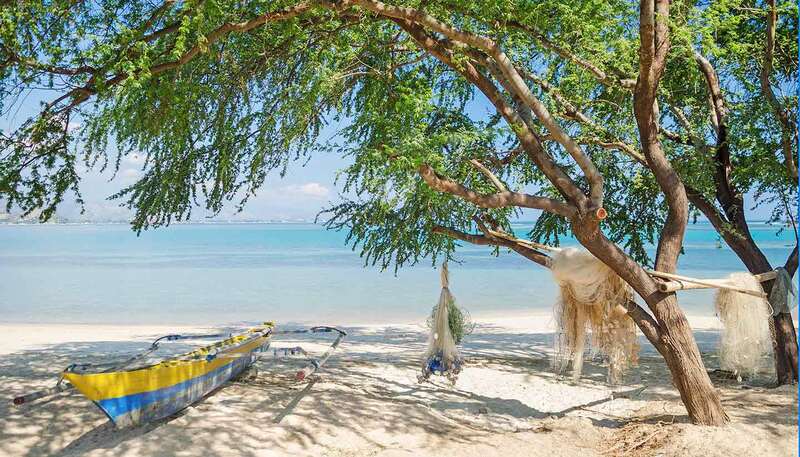 Despite the tragic recent history, East Timor's immaculate reefs, little-trodden mountain paths and rich, traditional cultural that has endured in the face of war make it a true hidden gem. Hiking in the hills will bring you to otherworldly jungle caves, while exploring settlements away from the capital of Dili give a taste of village life. Well off the beaten track, East Timor is still getting back on its feet, but is a raw and compelling destination. 14,919 sq km (5,760 sq miles). President Francisco Guterres since 2017. Prime Minister Taur Matan Ruak since 2018. Crime continues to be a problem in East Timor (Timor-Leste), including gang-related violence (not directed towards foreigners), robbery and assault. Consular support may be limited in Timor-Leste as there’s no resident British diplomatic mission. Emergency consular services are provided by the New Zealand Embassy in Dili (24 hour emergency number: +670 7732 1015) and the British Honorary Consul. For all routine consular issues, contact the British Embassy in Jakarta, Indonesia. Although there’s no recent history of terrorism in Timor-Leste, attacks can’t be ruled out. To contact the emergency services, call 112 or 7723 0635 (police), 3312210, 3324019 or 7230686 (fire) and 7723 6662, 33110441 or 7233212 (ambulance). Crime continues to be a problem in Timor-Leste, including gang-related violence, robbery (in some cases armed), and assault. There have been attacks on foreigners in Dili during the hours of daylight and darkness. Be vigilant at all times and avoid displaying expensive items of jewellery or carrying large sums of money. There have been reports of harassment and violence against women (including foreigners). There are occasional incidents of fighting between groups in various districts around Timor-Leste, often but not always related to martial arts groups. These incidents often involve stone throwing and occasionally machetes and knives. Most happen at night. Foreigners haven’t been targeted, but leave the area immediately if you’re aware of fighting. Take care if you go outside after dark. Avoid travelling alone or to isolated areas. Be particularly vigilant in border areas. Crocodiles are frequently seen on the south coast and have even been seen at beaches near Dili. Poor road quality makes driving in Timor-Leste hazardous. Accidents are frequent especially involving motorcycles. Drivers must hold a current driving licence valid for the class of vehicle they plan to drive. Take extra care when it’s wet. Outside of Dili, travel in convoy whenever possible. Main routes are often single-track mountain roads, which can deteriorate rapidly and become impassable, particularly during the rainy season (November-April). There have been incidents of piracy and armed robbery against ships in neighbouring waters. Mariners should be vigilant, reduce opportunities for theft, establish secure areas onboard and report all incidents to the coastal and flag state authorities. The UN peacekeeping operation ended its mandate in December 2012. The security situation in Timor-Leste has improved but underlying tensions remain especially during election periods where the security situation could deteriorate with little warning. If you become aware of any nearby military activity you should leave the area immediately. If you are inside and become aware of military operations in your immediate area you should take cover away from windows. Avoid any demonstrations and large crowds, as these have the potential to deteriorate quickly and turn violent. Make sure your travel documents are up-to-date and available in case you need to leave at short notice. Keep a photocopy of the relevant pages of your passport to avoid any complications. Although there’s no recent history of terrorism in Timor-Leste, attacks can’t be ruled out. You should be aware of the global risk of indiscriminate terrorist attacks, which could be in public areas, including those visited by foreigners. Don’t become involved with drugs of any kind. Penalties for breaking the law can be severe. A tourist visa costs US$30 and can normally be issued to the holder of a valid British passport on arrival at Dili International airport or Dili seaport, provided entry into Timor-Leste is regarded as being for a legitimate purpose. The visa will be valid for a single entry and will allow you to stay for up to 30 days. British Citizens intending to enter the country via the Indonesia (West Timor) land border crossing at Atambua/Batugade need to apply in Kupang for a tourism visa in advance. This visa will generally be valid for a single entry and a duration of up to 30 days. In Dili, tourism visas can be extended to a total of 90 days, for a fee. If you plan to travel overland (rather than by the ferry) to the exclave of Oecussi you’ll need to apply for an additional visa. You must present your round trip ticket and complete the required forms at your nearest Timor-Leste embassy or consulate, or in Dili, prior to travel. For information on other types of visa see the Immigration Department of Timor-Leste. Your passport should be valid for a minimum period of 6 months from the date of entry into Timor-Leste. UK Emergency Travel Documents (ETDs) are accepted for exit from Timor-Leste only. You can’t use an ETD to enter the country. If you wish to transit Timor-Leste, you should contact the Immigration Department of Timor-Leste before you travel to confirm the requirements. Medical services in Timor-Leste are limited, particularly outside Dili. In the event of a medical emergency, evacuation to Australia or Singapore is likely to be the best option for treatment. Make sure you have adequate travel health insurance and accessible funds to cover the cost of any medical treatment abroad and repatriation. Malaria is rare. Dengue fever remains a risk throughout Timor-Leste, during the rainy season, which runs from November to April. There have been no reported cases of rabies. If you need emergency medical assistance during your trip seek up to date local advice from foreign residents and/or dial 110 and ask for an ambulance. You should contact your insurance/medical assistance company promptly if you are referred to a medical facility for treatment. Earthquakes can occur at any time. There have been no significant earthquakes since 2005. The rainy season in Timor-Leste normally runs from November to April. You should monitor local and international weather updates from the World Meteorological Organisation. See our Tropical cyclones page for advice about what to do if you are caught up in a tropical cyclone. Bring US dollars in cash or travellers’ cheques. The limited banking system in Timor-Leste will not exchange Pounds Sterling cash or Sterling travellers’ cheques. The same often applies to Euros. Credit cards are of little use outside of major hotels. In Dili, ATMs are limited. Mastercard is not accepted anywhere. ATMs, banks or credit cards facilities are very limited outside Dili. Bring small notes when travelling in districts as large denominations are hard to change. Notes older than 2009 are usually rejected.